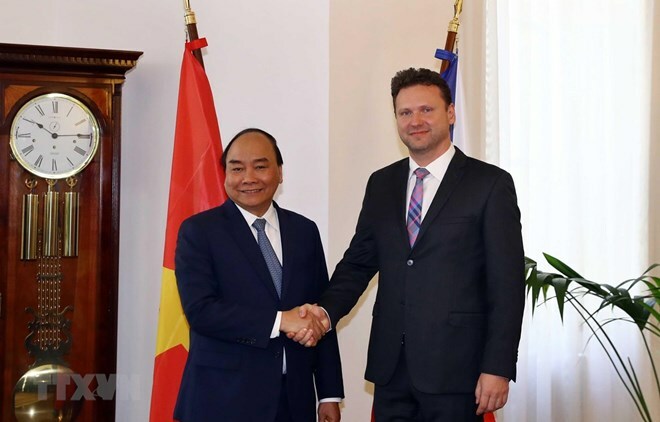 Phuc asked the Chamber of Deputies of the Czech Republic to maintain efforts to help boost the European Union’s signing and ratification of the EU-Vietnam Free Trade Agreement (EVFTA) and the EU-Vietnam Investment Protection Agreement (EVIPA). He suggested both sides step up the exchange of experience in legislative affairs, strengthen cooperation between the Vietnam-Czech Republic, and Czech Republic-Vietnam Friendship Parliamentarians’ Groups, and bolster collaboration in education-training, science-technology, environment, agriculture, labour and between their localities. The Vietnamese Government leader requested the lower house to continue creating favourable conditions for the Vietnamese community in the country. He also forwarded NA Chairwoman Nguyen Thi Kim Ngan’s invitation to visit Vietnam on the occasion of the 70th anniversary of bilateral diplomatic ties in 2020 to Radek Vondracek. The host spoke highly of PM Phuc’s visit, saying that it demonstrates an important development step in bilateral relations. He affirmed the Chamber of Deputies attaches importance to Czech Republic-Vietnam traditional friendship, and totally supports the early signing and ratification of the EVFTA and the EVIPA. He voiced his belief that the early opening of a direct air route connecting Prague and Hanoi will contribute to fostering bilateral cooperation in trade, investment and tourism.